It’s arepa day! Both hands are prepared and flavours are waiting to be chosen in the midst of desire. 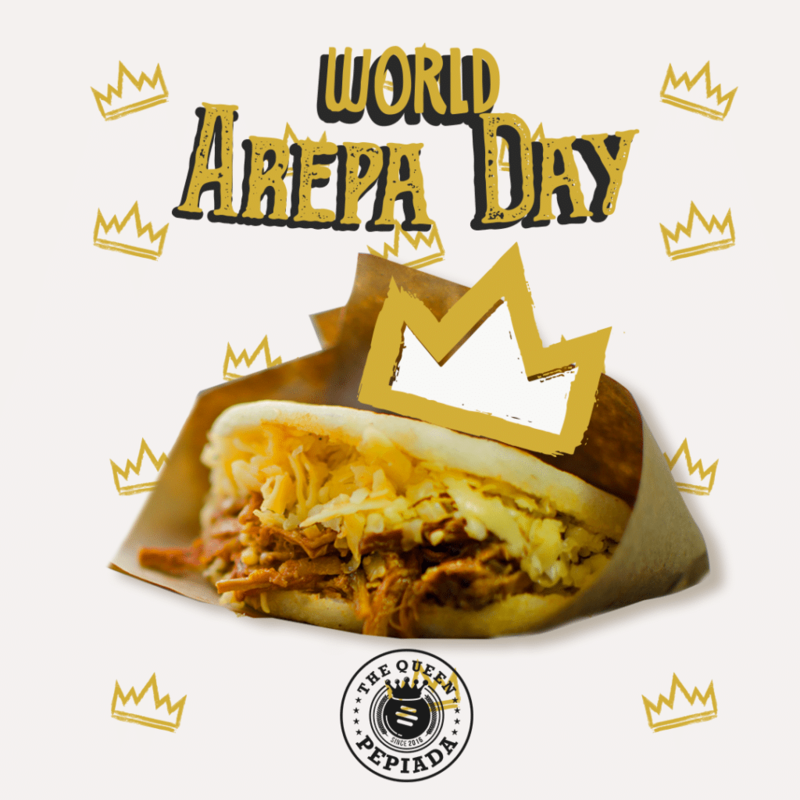 Cardiff rocks with the World Arepa Day. The great arepazo! A worldwide arepazo is the overflow of the closest flavours to the Caribbean. Wales has received Venezuelan cuisine with its culture with both hands and hearts jumping from tasted diversity. In The Queen Pepiada we celebrate this Saturday, September 10, the World Arepa Day. Our family business is history too. Recreating years of knowledge and stories of Venezuelan cuisines through our recipes and exciting combinations has brought us satisfaction and pride. The arepa is pillar of the Venezuelan food, especially for breakfasts and dinners. Knowing its origin is difficult because it matches more to a territory than a country. Colombians and Venezuelans keep arguing who’s the real copyright owner. However, as it as it is an indigenous dish and these shared all these lands, discuss their origin is not as attractive as the way in which flavors emerge from within. In this, the Venezuelans combine and recreate combinations unimaginable to the palate. So we do. Just think of a disc-shape bun made of processed corn, hot and tasty, from which vegetables, meat, pork or beans emerge directly. When an arepa is taken between the hands, it is never released until the last bite is savored. And once bitten, history is there too. Along with other dishes like hayaca (also made of corn and closer to the Mexican tamal), with arepas indigenous people made community, kept their culture and shared with each other. How it is nowadays? homo urbanis stops off the agitated city life to give itself a moment of glory in the concrete, the steel and the cement. An arepa is the size and time of a hungry break and it is always shareable. Early stages of arepas, about 3,000 years ago, were more than the heat of the ember. Corn was chewed, yes! Chewed by the Indians and placed in a bowl of clay and then cooked in the form of rounded loaves. In later stages, they peeled the corn and processed the grains with stones. Last but not least, they came with the invention of the pylon, a larger wooden apparatus, generally a trunk tree carved from the inside into a cavity, there corn is milled in that kind of large mortar. In the midst of city rush budare rules. Processed flour is cooked in circles in the form of a disk and then refilled. A budare is a clay or iron dish used to cook the corn bread. Cardiff celebrates history and tradition this September 9th at Street Food Cardiff. The Queen Pepiada brings us the pleasure of meeting in a historical bite served in delicious ways. We always make a tidy job on that.